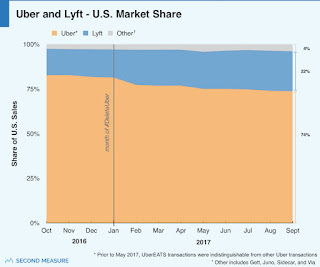 Lyft has grown twice as fast as Uber in the past year and while the former's market share is up only 2%, Uber's is down 10%. Dont let anyone ever tell you an intangible like reputation doesn't matter. Uber’s business has grown by 15% from March to September in the U.S. That was after more than 400,000 Uber riders deleted their accounts earlier this year in the wake of the #deleteUber campaign, which led to a drop in business. 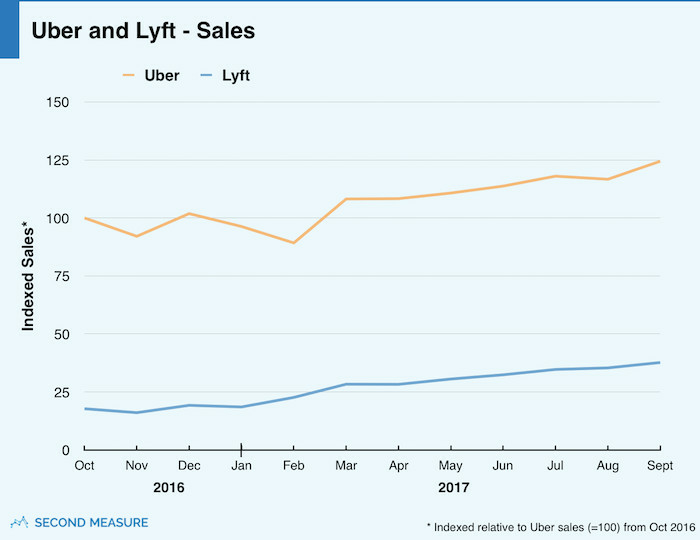 Still, Uber’s sales have grown slower than its rival Lyft, which saw a 33% increase in sales in the same period. Lyft now controls 22% of the market. Uber’s share is still down from last year, owning 74% of the U.S. ride-hailing market compared with 84% last year. Uber is coming to the close of its worst year ever, sparked by the first of two #deleteUber campaigns in January, followed by a leadership shake-up and an ongoing shareholder battle. But the $69 billion company is beginning to see its business recover in the U.S., according to new data. Uber’s business has grown by 15 percent from March to September in the U.S., according to credit card analytics company Second Measure. That was after more than 400,000 Uber riders deleted their accounts earlier this year in the wake of the #deleteUber campaign, which led to a drop in business. 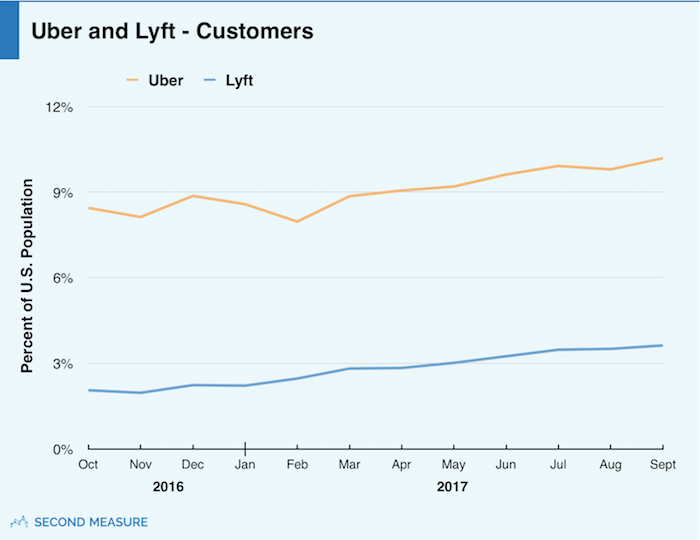 Still, Uber’s sales have grown slower than its rival Lyft, which saw a 33 percent increase in sales in the same period. Lyft, which according to sources is not yet profitable in the U.S., expanded into more than 160 new cities this year and now operates in more than 360 cities. It recently hit one million rides a day for an annualized run rate of 350 million miles. Uber, on the other hand, was much more aggressive about its expansion both in and outside of the U.S. and reached the one million miles a day milestone in 2014. Now the company is in the hands of its new CEO, Dara Khosrowshahi, who plans to turn the Uber image around as he prepares to eventually take it public. 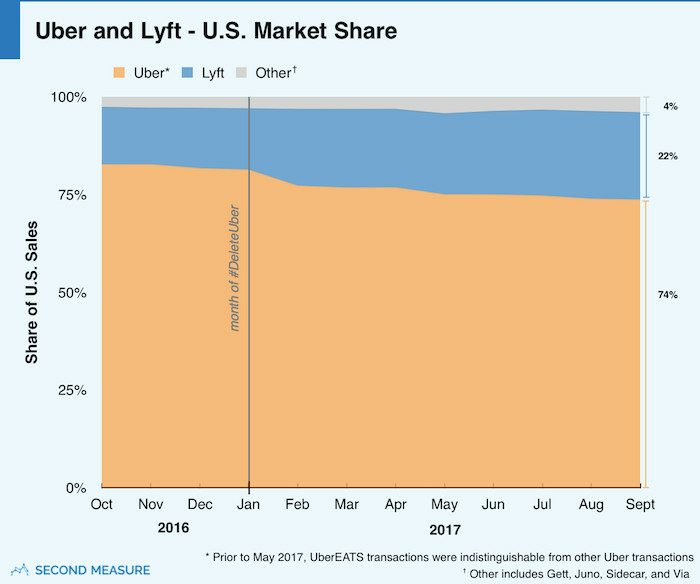 Lyft’s share of the market is still growing. The company had less than 20 percent of the market before January and now controls 22 percent of it. Uber’s market share is still down from last year, owning 74 percent of the U.S. ride-hailing market compared with 84 percent last year. This year marked the first time Uber’s business has been materially impacted by its public relations issues. It was also the first time Lyft was able to capitalize on Uber’s woes. Yet, there’s much more room to grow in the U.S. In September, only 10 percent of all U.S. consumers took Uber and 4 percent took Lyft. Surprisingly, the majority of those that do take ride-sharing services typically use one service exclusively — not both. As of September, 71 percent of ride-hail consumers used Uber exclusively and 19 percent used Lyft, up from 13 percent in December before the #deleteUber campaign. Only 10 percent use both services.